First Line: It was only a matter of time. Ten strangers have been lured to a remote Scottish island and the estate of the wealthy and reclusive Lord Black. What brings them all together? They've each received a letter accusing them of having committed crimes. Only a short period of time elapses before their one escape off the island disappears, and they begin being picked off one by one. Who's the killer? 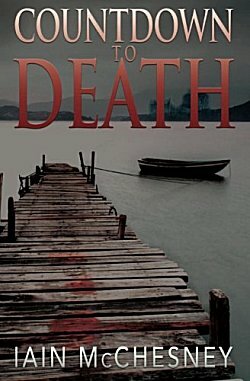 I'm always a sucker for a remote island off the coast of Scotland, but once past the setting in Countdown to Death, I was faced with McChesney's version of Agatha Christie's And Then There Were None. Although the author's treatment of the story is well-done, I'm the type of reader who needs more than a puzzle to solve in the mysteries I read. However, if you're in the mood for solving a quick, light puzzle this could very well be the perfect read for you. That remote island strikes a chord!